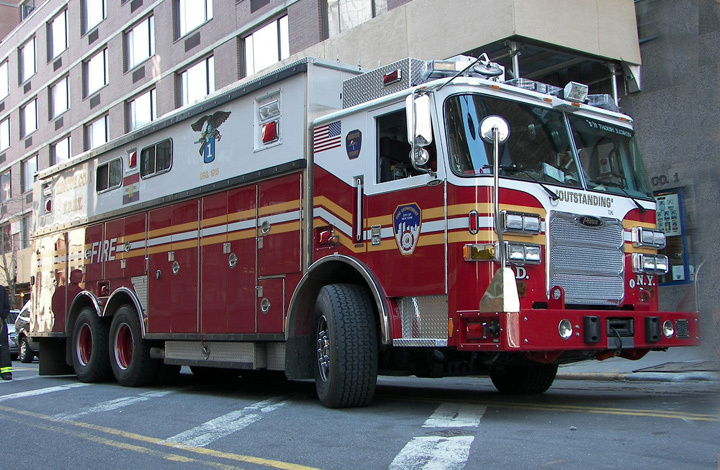 This rig is likely the most famous in the United States – the FDNY’s famed Rescue-1. The 2006 Pierce Arrow XT™ was delivered by dealer Firematic through a Federal contract administered by the General Services Administration. The new Rescue-1 runs with the Tak-4 22,500 lb front suspension and 270 customized options called for by the FDNY. The current Rescue 1 replaces an E-One Salisbury model that had been ordered prior to 9/11/01. That model was designed by Rescue-1 Captain Terry Hatton, who was lost during the collapse of the south tower. It now sees first in action in an adjacent borough. An interesting fact for European members: This 2007 Pierce was not purchased with taxpayer money. Rather it was paid for and donated to the FDNY by Airbus. Of the 5 Heavy Rescues operating in New York City, all were donated. Added by Lou Angeli on 24 July 2007. Lou, does mean that the FDNY is underfunded and doesn't have the resources to purchase what they need? Or, are machines like the above, 'nice extra's' which they don't really need, but are pleased to have when someone gives them one? Added by Barry. on 25 July 2007. Barry - following the events of 9/11/01, every Heavy Rescue (with the exception of Rescue 4) was totally destroyed. In addition, many other special operations units, for examples Squad Companies, were lost as well. The loss of equipment was compounded by the knowledge that half of the special operations staff were missing or dead. What was once the nation's elite firefighting unit was in a shambles. The Mayor's office was willing to replace the apparatus under existing replacement criteria. In the meantime, companies were forced to utilize reserve apparatus, which in New York means "barely operating." It was very bad situation, and I recall departments from throughout the East Coast delivering loaner apparatus to FDNY stations. I believe that the Mayor's office was hoping that the federal government would somehow fund an expedited apparatus replacement program. Never happened. So corporations from around the globe "sponsored" specific apparatus, allowed company members to design them, then simply picked up the tab. Other benefactors included Ferrara Apparatus, the firefighters' union, actor Denis Leary, and many others. Added by Lou on 25 July 2007.